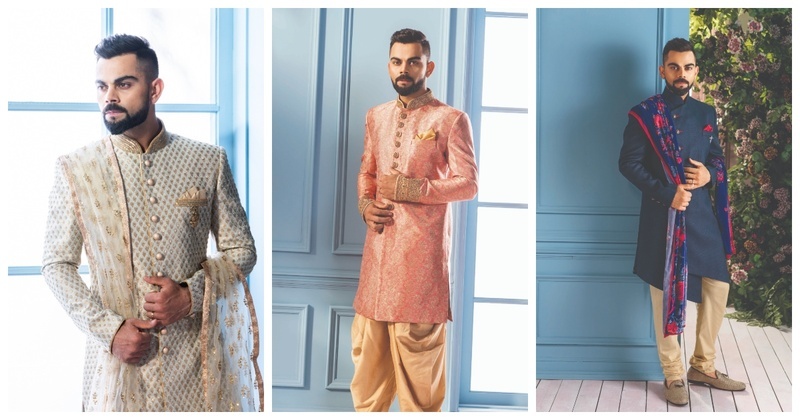 Grooms and groomsmen, Manyavar's Latest Wedding Collection is a MUST-SEE this season! Whether it is your dad’s friend’s neighbour’s daughter’s wedding or your own sister’s wedding, you’ve got to be dressed well from head to toe! Ladies usually know what to wear well in advance but our men on the other hand? They’ll be running helter skelter a day before, crying that they have only a loose tee-shirt and shorts to wear to the event! We usually have answers for brides and bridesmaids but grooms and groomsmen, we’ve finally heard you! We found a one stop solution for y’all so that you’re not running everywhere but straight to Manyavar! Manyavar’s Wedding Collection or the ‘Virat Collection’ as they call it, is a fresh approach to men’s fashion. They have some offbeat nuanced colours which have been introduced for the first time in a groom’s trousseau such as pista greens, soft peaches, wine and mid-night blues. Soft peach textured kurta with zardosi work paired with golden dhoti pants is a refreshing change! An offbeat pista green sherwani with a tulle dupatta for every groom who wants to impress his bride! This navy blue kurta paired with patiala is perfect for the brother of the groom/bride! In love with this wine sherwani with gold zardosi work! The velvet dupatta adds glamour to the midnight blue sherwani! Asymmetric royal blue kurta for all those who are up to date with the latest fashion trends! A midnight blue double breasted kurta with an asymmetrical cut that’ll make heads turn! So which one is your favourite? Let us know in the comments section!